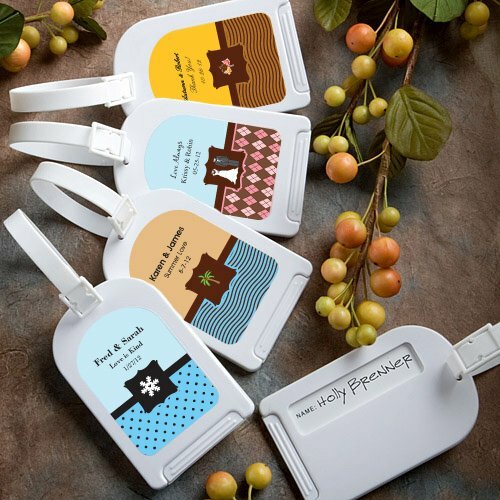 The perfect favor for a destination wedding, these luggage tags will be well-received by your guests! Select from a number of color combinations and seasonal designs to create a personalized label fit for your special day. Each sturdy white plastic luggage tag measures 3 1/4" by 2 1/8", with an attached white pvc strap. Minimal assembly is required to adhere the self-stick labels to the front of each piece, and the back includes a window opening for identification. The inside of the tag has a slot to include personal details in case luggage becomes lost. I need to know how I can preview the product I just personalized prior to placing the order. The personalization needs to be done in the page where you put in your shipping address, after you've added the item to your cart. I’m not sure if you’ve gotten to that page yet. If you did it on the product page, it won’t carry over. It’s a limitation of our system but we’re fixing it next month.